Born in Paris from vietnamese parents, he began to play drums at the age of 15, then took up guitar & electric bass. After graduating in Visual Arts, he majored in Philosophy, writing a thesis on Exoticism. Then he devoted to music, creating "ULTRAMARINE" (1983), a multi-ethnic band whose CD "DÉ" has been considered "1989' s best World Music album" Philippe Conrath, Libération. Nguyên LE is a self-taught musician, with a wide scope of interests : Rock & Funk (Jim Cuomo, Madagascar tour 84), Jazz standards & contemporary Jazz (bass player with Marc Ducret, guitar player with Eric Barret), Improvised Music (Yves Robert), Singers (Ray Charles), Contemporary Music (André Almuro, Tona Scherchen, Marius Constant, Mauricio Kagel), Ethnic Music : African & Caribbean with ULTRAMARINE , Algerian with Safy Boutella & Cheb Mami, Indian with Kakoli, Turkish with Kudsi Erguner, Vietnamese with his "Dan Bau" (traditional one-stringed instrument) teacher Truong Tang. In sept. 87 he was chosen by director Antoine Hervé to play with the O. N. J. (French National Jazz Orchestra). Within this big band, he played with such musicians as Johnny Griffin, Louis Sclavis, Didier Lockwood, Carla Bley, Steve Swallow, Randy Brecker, Toots Thielemans, Courtney Pine, Steve Lacy, Dee Dee Bridgewater, Gil Evans, Quincy Jones. Nguyên LE' s work also deals with programming synthetizers, effects & computers as well as writing orchestral pieces : "PROCESSOR" composed, arranged & recorded on CD "O.N.J. 87" & "LUNIK II" co-arranged with Dominique Borker & performed by the O.N.J. 1989. In sept. 89 he records ULTRAMARINE's 2nd album "DÉ" &, in may 90, his first album as a leader : " MIRACLES " recorded in the U.S.A. with Art LANDE, Marc JOHNSON & Peter ERSKINE. At the same time he works with such musicians as Michel Portal, Miroslav Vitous, Trilok Gurtu, J. F. Jenny Clarke, Aldo Romano, Daniel Humair, Dewey Redman, Andy Emler, Jon Christensen, Nana Vasconcelos, Glenn Ferris, Christof Lauer, Paolo Fresu, Kenny Wheeler, John Taylor ... In may 92, after a month tour with Paul McCANDLESS on winds, Art Lande (p), Dean Johnson (b) & Joël Allouche (d), he records his 2nd album ZANZIBAR, which gets the « ffff » award by Télérama. In Jan. 93 he records "INIT", a trio with André Ceccarelli, François Moutin & guest Bob Berg, while setting up a new band on the music of Jimi Hendrix, w/ Corin Curschellas (voc), Steve Argüelles (d), Richard Bona (b). Since Jan. 93 he's been a frequent guest soloist of Köln's WDR Big band, especially with composer/director Vince MENDOZA. Nguyên Lê plays on three of his projects : "Jazzpaña", "Sketches" w/ Dave LIEBMAN, Charlie MARIANO, Peter Erskine, & "Downtown", w/ Russell Ferrante. In April 94 he's the guest soloist of "The New Yorker", a suite by Bob BROOKMEYER, with Dieter Ilg (b) & Danny Gottlieb (d). With these two musicians he set his first trio, & recorded "MILLION WAVES" in dec. 94 . About this CD, Télérama writes : "This trio brings him to some musical spaces which he had not even imagined, & which are pure poetry". In the meantime, he's playing in trio with Michel Benita(b) & Peter Erskine, recording on Michel Portal's new album with Ralph TOWNER (g), & working with Ornette COLEMAN on one of his contemporary music pieces, "Freedom Statue". In June 95 he's invited by WDR BigBand in "Azure Moon", with the YELLOWJACKETS & Vince Mendoza. In July 95, in Stuttgart Festival, he's one of the guest guitar players to celebrate the "Universe of Jimi Hendrix", besides Trilok Gurtu, Terry BOZZIO, Cassandra WILSON, Jack BRUCE, Vernon REID, David TORN, Victor BAILEY, Pharoah SANDERS... Recently he has been playing with John McLaughlin, Michel Petrucianni, Markus Stockhausen, Enrico Rava, Ray Anderson, Kenny Wheeler, John Taylor, Dave Douglas, Wolfgang Pushnig, Uri Caine... In April 96, Nguyên Lê creates "Tales from Viêt-Nam", a project on Vietnamese music, with a 8-piece band blending jazz & traditional musicians. With stage director P. J. San Bartolomé, he starts " Of the Moon & the Wind ", a complete show where traditional & contemporary vietnamese dancers are integrated to the "Tales from Viêt-Nam" orchestra. The CD has received a great welcoming from international critics : Diapason d'Or, Choc du Monde de la Musique, Choc of Year 1996 Jazzman, 2nd best CD 96 for JAZZTHING (Germany), Best CD 96 on radio TRS 2 (CH), "a minor masterpiece" JAZZTIMES (USA). On 4/97 Nguyên Lê releases his 5th CD, " 3 Trios", with Marc Johnson/ Peter Erskine, Dieter Ilg/ Danny Gottlieb & Renaud Garçia Fons/ Mino Cinelu. JAZZIZ Magazine USA says : « At times, jazz guitar can sound staid - but not in the case of N. Lê. He's forever breaking boundaries for our benefit ». He has recorded 2 Cds with Paolo Fresu's quartet : « Angel » (2/98) & « Metamorfosi » (4/99). On 5/98, 6th N. Lê record : « Maghreb & Friends », an exploration of Maghreb musical traditions & a deep collaboration with Algerian musicians. « Far from a false world music, N. Lê simply touches, with force & intensity, to universality » F. Medioni. N. Lê produced the 1rst CD of Huong Thanh, « Moon & Wind », entirely done in his home studio. He also has been nominated for the « Victoires de la Musique 1999 » award. His last CD, « BAKIDA », based on his regular trio with Renaud Garçia Fons (b) & Tino di Geraldo (perc, dr) plus guests from all over the world like Kudsi Erguner, Chris Potter, Carlos Benavent... This CD has been voted "best jazz album of the year" by "CD Compact" (Spain). ELB, a new trio CD has just been recorded in Rainbow studios, Oslo, with Peter Erskine & Michel Benita. He's touring with Terri Lyne Carrington's band, with Geri Allen, Matt Garrison & Gary Thomas & plays with Maria Schneider. Sept 2002 : 2nd CD of Huong Thanh « Dragonfly ». In june 2002 he's invited by the Metropole Orchestra (NL) to play his music arranged by Vince Mendoza. « Purple », an album celebrating Jimi Hendrix is released in sept 2002. In sept 2002 it's n° 1 on the charts of UK magazine "Jazzwise". Today it's N. Lê's most successful album, with 20 500 CD sales & non stop touring all over the world. "Mangustao", Huong Thanh's 3rd album, released in jan. 2004, is awarded as "Choc de la Musique" by french magazine "Le Monde de la Musique". In March 2005 release of "Walking on the Tiger's Tail", new album with his great friends Art Lande, Paul McCandless & Jamey Haddad "A universe where the alliance between acoustic and electric, improvisation and writing, inner delicacy and virtuosic expressivity reach the ideal balance."(LeMonde). Several projects were built in 2006 : the score writing of "Le Sheitan", a movie by Kim Chapiron with Vincent Cassel, & « Homescape », a very electronic, improvised & mystical recording in duo with Paolo Fresu & Dhafer Youssef, all done at home, #1 in « Jazzwise » april 2006 charts; the score for the vietnamese movie "Saigon Eclipse" by Othello Khanh; the recording of "Mozart" last Uri Caine's album; a 13-gig tour in USA with "Tiger's Tail" quartet, thanks to a CMA/FACE grant; two "classical" compositions commissionned by the Ahn Trio & the Laguna Beach Fest in LA. 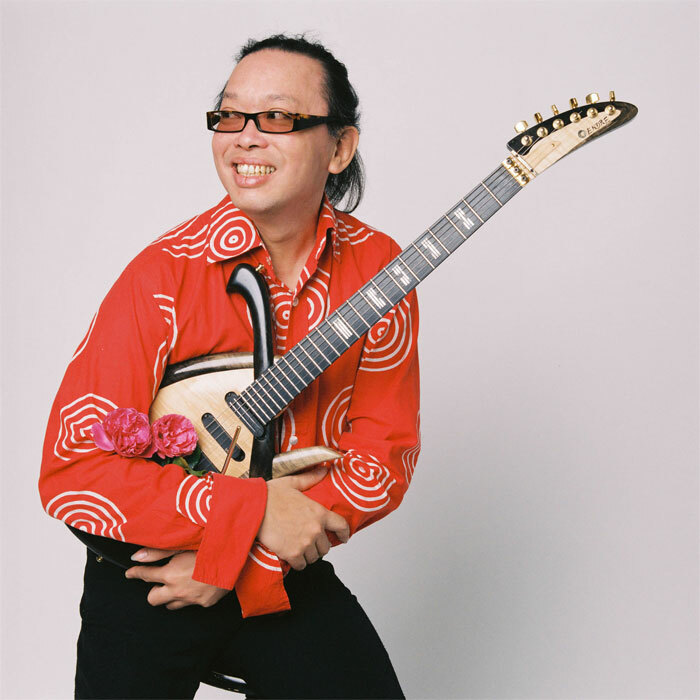 Nguyên Lê was unanimously awarded as the guitar "Django d'Or" 2006. In 2007, after tours in US & China, he releases "Fragile Beauty", the 4th album with Huong Thanh « simply an album that captures the heart from the first note and leaves it hungering for more as the last one fades » (All That Jazz). In 2008 he records "The Othello Syndrome" for Uri Caine, "Blauklang" for Vince Mendoza's & also « Dream Flight » a new ELB album, with guest Stéphane Guillaume on sax.